These collection-worthy 1 oz Silver Peregrine Falcon Coins are minted with a limited release of 1 million silver coins. It is the first of four coins in the Royal Canadian Mint's exciting new Birds of Prey series, a follow-up to the popular Canadian Wildlife Series. The peregrine falcon is one of the most striking, beautiful and graceful predatory birds. Achieving speeds of over 300 km/h (200 mph) in aerial dives, this crow-sized bird is the fastest animal in the world. The back of this .9999 fine silver coin bears the image of a peregrine falcon in mid-air attack designed by the Canadian artist Emily Damstra. A portrait of Her Majesty Queen Elizabeth II by Susanna Blunt appears on the front surface of this legal tender coin. You can store your 2014 1 oz Silver Peregrine Falcon Canadian Birds of Prey Series Coin safely and securely with Kitco Allocated Storage. 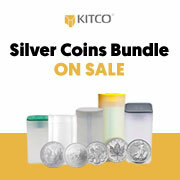 Kitco offers various global options for silver bullion storage that are fully segregated, insured and allocated. Kitco's network of top-tier silver vaults include some of the most secure silver coin storage facilities located in Canada, Hong Kong or the United States (COMEX approved). Cayman Islands silver storage is also available (certain conditions apply). Find out more about keeping silver coin purchases secure, with our Global Precious Metals Storage Solutions. Today, the Mint's superior technical capabilities allow it to set new benchmarks in silver bullion coin design and quality. Why buy Silver Falcon Coins from Kitco? Kitco is the trusted leader in the precious metals industry. Silver bullion coins and other precious metals sold by Kitco are recognized in bullion markets around the world. With our focus on silver bullion coins, you benefit from pricing and premiums that are highly competitive in the industry. At Kitco, we make it easy for you to manage your wealth. The Silver Peregrine Falcon Coin(s) you receive may not be in absolute mint condition.